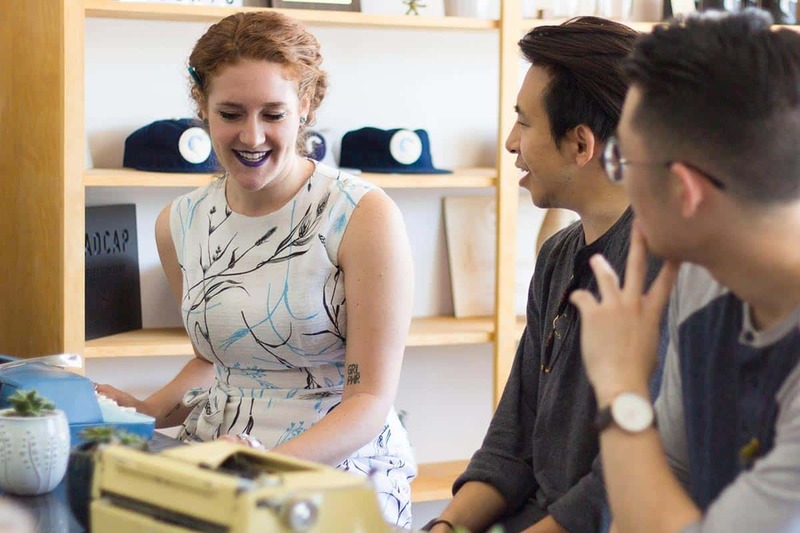 When The Haiku Guys + Gals sit down at our typewriters for a special event to write on-the-spot haiku, we encounter a wide range of reactions. While some poetry aficionados guests immediately know the poetic form, others call back to a vague memory of learning about it in elementary school. Sometimes, people don’t have a clue. No matter the level of familiarity, we’re always glad to break it down. Haiku is an ancient form of poetry originating in Japan as long as one thousand years ago. In Japanese, hai means unusual and ku means verse or strophe. In the English language take on haiku, he most common form is a compact three-line poem—the first and third lines are made up of five syllables, and the second is seven. 5-7-5. Just 17 little syllables to make up one incredible poem. Aside from syllable constraints, there are two other features that make a haiku, well, a haiku. The first is kireji, or a “cutting word.” The kireji is what gives the poem an axis on which it can turn. It is usually a single word or short phrase that adds weight to the poem, establishing the relationship of speaker’s observations to the poem’s mood. The second traditionally required feature is a kigo, or a reference to the season occuring in the poem. Used in other forms of Japanese poetry, this word evokes natural imagery, oftentimes indicates a specific time of year. The tradition of haiku is incredibly rich one. While haiku in English is a bit more simplified than its pure Japanese form, its constraints open up a vast poetic world that admirably strives to do as much as possible with very little. The Haiku Guys + Gals deeply respect where haiku has come from and cherish this model as we help share it in a new place and time. While not all our poets strictly adhere to the classical standards while writing poetry at parties and events, our contemporary take and creative experimentation is always in honor of our favorite unusual strophe.